When the 3rd Congressional district was last gerrymandered as it was passed from Tony Hall to Mike Turner by the powers that be, it went from a compact, reasonable district that roughly matched Montgomery County boundaries to a sprawling mess that looks like a monkey with an etch-a-sketch tried to draw something and it was superimposed across SW Ohio. Montgomery County leaders made a plea to Gov. John Kasich to keep the 3rd Congressional District intact with no further split as part of the redistricting process. 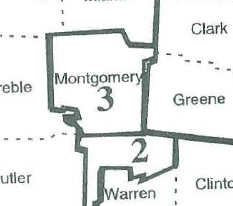 In the last redistricting in 2001, Montgomery County was divided, with about 22 percent going into the 8th District and the remainder being retained in the 3rd District, Commission President Debbie Lieberman and Commissioners Judy Dodge and Dan Foley wrote in an Aug. 15 letter to the governor. via Commissioners urge Kasich to preserve 3rd District. As someone who has run for the seat, I can tell you that it’s an incredibly difficult district to canvass and cover. It also leans Republican, just like almost all SW Ohio congressional districts. For the County Commissioners NOT to be lobbying to return to something more manageable should make one think about their own suitability for office, before re-electing any of them. OMG!!! That’s horrible!! Something HAS to be done about this!! Chillicothe is a media market? THey should start with Montgomery County and build the district around the county by adding suburban areas like Beavercreek, Fairborn, Springboro, etc…and/or expand it north to take in Miami County. They should set up the district like the districts around Louisville and Lexington, which make sense from a regional and socioeconomic POV, particularly the district around Lexington, which addresses the fact that that city is the heart of an economic region that reaches into rural areas. You could make a very similar case with Dayton and the surrounding Miami Valley (Preble, Darke, Miami, Shelby, Greene counties) . If the county was to be divided up it would make more sense to redistrict the Butler/Warren County areas into Boehners district, or if you have to split the county add Washington and Miami Twp to Boehners district since they are becoming more oriented to Cincy/I-75 corridor. I think this is how it used to be back when McEwen was Congressman. back in the late 1980s. Yeah, I can understand the commission not wanting to split up the county even more than it is, but they should be lobbying not for the status quo but for a more sensible centered on Montgomery County. Congressional candidate John Mitchell weighs in, he’s run against Austria and Hobson. 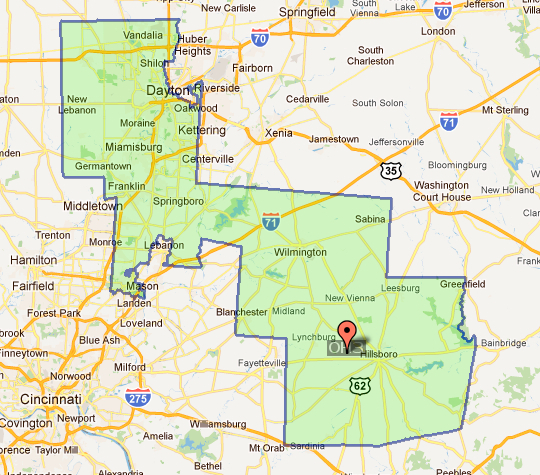 RE: Redistricting could pit Turner against Austria in the 2012 primary, DDN, August 23, 2011. It’s only fitting that the status quo apologists made their appeal to keep both Austria and Turner at the “overtaken-by-events” NCR facility on S. Patterson, now the property of the University of Dayton. There’s not a more fitting monument to the failure of local, state and federal governments in southwest Ohio than NCR’s exodus to Atlanta. Career politicians like Turner, Austria, DeWine,Voinovich, Hobson, Taft and Boehner have failed the Miami Valley for decades and yet the Chamber of Commerce, Dayton Development Coalition and other “public-private partnerships” continue to mount the horse that dragged us to the abyss. This has nothing to do with protecting Wright Patterson or Miami Valley jobs. No, it’s got everything to do with protecting career politicians and their special interest friends that provide the campaign cash to keep them in office. Wright-Patt is the only success story our politicians can hang their hat on, and the simple truth is, they had little or nothing to do with it as this national treasure would be fine with or without the politicians’ meddling. Actually, Wright-Patt has had three touching congressional districts since the 2000 redistricting, including Austria (7), Turner (3) and Boehner (8). You would think House Speaker Boehner, one of the three most powerful politicians in Washington, and one other Congressman would be sufficient to represent Wright-Patt, but that’s not enough insurance for those getting six-figure salaries at the Chamber, the Coalition and elsewhere. In their search for a mission to justify their existence, these 21st Century feather merchants have revealed their true colors, and no where in that mosaic is there genuine concern for the citizens, only self-interest stacked atop arrogance.